These renders aren’t final yet, but a vision for a football stadium in Płock is long overdue. A 12,000-capacity stadium might become one of Poland’s most interesting in its class. Earlier today in Płock (110 km north-west of Warsaw) a milestone was reached, even if only symbolically. It’s not construction yet, not even the final design renderings. But what you see here is very close to the complete design concept (to be released in December). It’s important because Wisła Płock was the single last football club in Poland’s top league not to have any stadium reconstruction plan. Now this has changed. What can be confirmed now is that Bańcza Studio, for whom it’s the first stadium study, delivered a very consistent and interesting scheme. While its aesthetics will depend on materials used, there’s potential to make it one of Poland’s best, of course when compared to others in its class. What class is it? Stadia between 10,000 and 15,000 capacity, ranked UEFA Category III or IV. Just a glance at the blueprints (partly revealed today) suggests there will be no redundant facilities, almost all would be focused within the west stand, leaving only catering and sanitary amenities for the remaining areas. A significant business club will be topped by a strip of private boxes and then topped by a second tier of seating. The west side would be the only one to have a double-tier layout. With the others remaining single-tiered, capacity should reach 12,000. Access to the stadium would be provided from level +1 in the West, South and East, while the northern grandstand lies lower and is available from level 0. 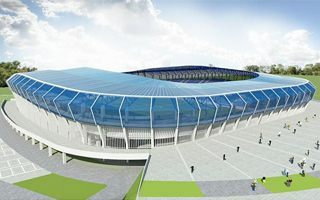 As was previously announced, the planned reconstruction of aged Stadion im. Kazimierza Górskiego would be phased in order to allow continuous football use. This will also facilitate financing for the project. How much would it cost? We have to wait for credible estimates now but if secured, the project could see groundbreaking between late 2017 and early 2018.